"Most of the great battles are fought in the creases of topographical maps." That is the introductory quote for the novel. And, yes, it is a novel. But its subject matter and detail certainly suggest recent history, post WWII history, in and around London during and after the war. To get a good sense of the time and place I suggest reading the four pages of "Acknowledgements" at the end of the book where information about sources is extensive and useful. This thought-provoking novel begins in 1945 post war London where Nathaniel and his sister Rachel are told that their parents will be leaving them for some time: "In 1945 our parents went away and left us in the care of two men who may have been criminals." Nathaniel and Rachel will be left behind. From time to time we are reminded that Nathaniel, who is telling the story, is telling it from some time later in his life as he tries to make sense of the events and characters he is introduced to in those post war years. One subject considered carefully is the memory as a means to the truth. ("There are times these years later, as I write all this down, when I feel as if I do so by candlelight.") The puzzles, the enigma, the mystery is compounded by the absence of the parents and by their being replaced by men who, it seems could be criminals involved in dog racing and the transfer of illicit goods by boat on the Thames. These men are called The Moth and The Darter and seem to have no other names. Who are they? What are they? The Moth takes care of the kids. Who is he? In fact, truth is a central subject of the work. We are reminded of the difficulty of knowing the truth about another person ("There's a photograph I have of my mother in which her features are barely revealed.") We talk of "truth" in philosophy classes as if it were a simple notion, "truth is the direct correspondence between words in a statement and states of affairs in the world" – but, of course, both sides of that formula are subject to interpretation and consideration. And in this novel, where events and names, actions and intentions, are purposely disguised it is even more difficult (and interesting) to untangle the truth. For example at one point (104) Arthur McCash tells Nathaniel, "Your mother is away. Doing something important." Who is Arthur? What is Rose doing that is important? Part One ends with a violent encounter that suggests the war is not really finished. November 1959. Nathaniel now 28 years old is in Suffolk village looking to buy a house which is being sold by Mrs. Malakite, the wife of Sam Malakite, who looked after Nathaniel when he was a boy. Nathaniel creates a map of the gardens, indicating where certain plants resided ("Sam Malakite remained a mystery to me. No one really understands another's life or even death." 127) He purchases the home and commutes to London to work for the government "to review various files in the archives covering the war and post-partum years." It is there that he learns more about his mother, her work during and after the war and the various other characters she surrounded him with while asway doing her secret work. Camouflage, fake airfields, maps that hide things … and the loss of Agnes, The Darter, and the others. These also are at the center of the book. Further parts begin to reveal more about the war time efforts of Nathaniel's mother. Even about the danger and the eventual death of Rose/Viola. The remaining parts begin to clear the clouds away, allow us to see more clearly what Nathaniel's mother was doing and the danger she encountered while doing it. Michael Ondaatje, as the books back flap reminds us, is the author of several award-winning novels, as well as a memoir, a nonfiction book on film, and several books of poetry. Among other accolades, his novel The English Patient won the Booker Prize. Michael Ondaatje lives in Toronto. Canada. 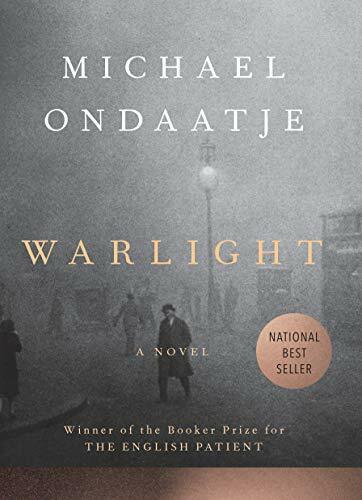 WARLIGHT is a first-rate novel and I recommend it highly! It has been a long time since I read a novel that made me think - and feel so deeply as this one.